We’ve all heard of the myriad ways that people learn, what the philosophers have called epistemology (the theory of knowledge and learning). Well now there’s a new approach to learning which seeks to prove that the traditional learning models used in today’s classrooms are not up to the job. Tom Tuohy examines the latest theory called Brain Based Learning. The earliest ideas about how humans learn came from the Ancient Greeks about two thousand four hundred years ago. They proposed that all our ideas come to us either at or before birth. These are often called rationalist or a priori ideas. The earliest proponents of these ideas were people like Socrates and Aristotle. Socrates suggested that in actual fact learning is impossible. Only recollection of the one, true, unchanging form that exists for everything known to man is possible. This came to be known as the Platonic Forms. Fast forward several hundred years to philosophers like John Locke and David Hume who were clearly not satisfied with this idea as it seemed to deny the existence of the nurture side of the nature/nurture paradigm. They therefore proposed that our minds are like blank slates – “tabula rasa” – that we learn from raw impulses that we get through our senses and, over time, develop into knowledge. This came to be known as a posteriori ideas or empiricism (e.g. gaining knowledge about the natural world by observing common occurrences and establishing specific laws about their behavior). An entire canon of literature has grown up from these two models and mushroomed into what we now know as modern education. But is this the only way to understand the process of learning? Aren’t there supposed to be many different kinds of learners? What about kinesthetic and tactile learners (learners who tend to be more ‘hands on’ and learn more by touching and feeling the world around them)? Aren’t there also visual learners (learners who tend to learn more through seeing; e.g. when something has been written on a whiteboard)? What about auditory learners (learners who tend to learn more through hearing and listening for information)? Clearly a “one size fits all approach” to learning was always in need of re-evaluation. In order to find out about the recent discoveries about the brain, I attended a presentation in Bangkok by Professor Curtis Kelly, a leading proponent of Brain Based Learning. Professor Kelly agrees that educational practices have changed little over the centuries. Professor Curtis Kelly explained to the audience of experienced EFL teachers how an understanding of these advances can make us all better teachers. As a language teacher for over 13 years, something that Professor Kelly said touched a raw nerve with me. He was talking about the Presentation, Practice, Production paradigm (PPP) which is used extensively in the EFL classroom, and he said that neuroscience has now proved that we have got it all wrong. When, for example, we use a knife to cut something, we don’t pick up a knife first, and then look for something to cut afterwards. In fact, it’s the other way around (like the old idiom that “necessity is the mother of invention”). Things are created or begun because there is a need for them, not the other way round. This seems to prove that the PPP teaching paradigm used extensively in EFL teaching is entirely wrong. “As a materials writer, I am always concerned with how to make effective lessons, and the usual style we use, PPP, is just not brain friendly. By first teaching learners certain language forms, like food vocabulary, then having them practice it with exercises, and then, finally, having them use it communicatively, by planning a picnic or the like, we are doing things in the opposite order the brain learns best. Our brains are built to solve personally relevant problems, not store random input for future use. Having them try to do something communicatively first and fail at it, and then teaching them the language they needed, would be a much more brain-compatible way of teaching.” This for me was one of those “Oprah moments” – an “aha!” moment, an epiphany that refused to go away. 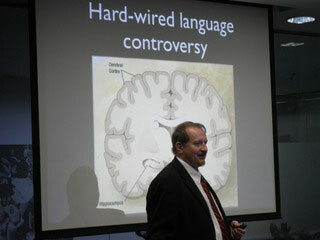 Professor Kelly then went on to talk about the new discoveries in memory and cognition, and how they can be applied in the classroom. BBL will play an increasingly prominent part in Thai education if recent news in Thailand is anything to go by. The Royal Thai Government (RTG) has set up a new organization called the National Institute for Brain Based Learning (NIBL) which recently initiated a new pilot program in six upcountry primary schools with plans to extend the trial to secondary schools next year. The aim of the trial is to promote the idea that learning methods should begin for children from the time they are in the womb right up to secondary school. Parents are also being encouraged to take a much more proactive role in their children’s development. The trial is also an attempt to see how effective BBL can be in raising the standards of education in Thailand. This is only one aspect of the RTG’s efforts in what is their Second Educational Reforms (the original reforms having been started in 1999). In fact, the RTG has guaranteed over 18 billion baht (about GBP 330 million) to provide free education for all students until the age of fifteen and to attract new teachers, as there is currently a shortfall of 100,000 teachers in the education sector. While nobody can predict what the future holds, we can only hope that BBL is as successful as many people believe it could be.